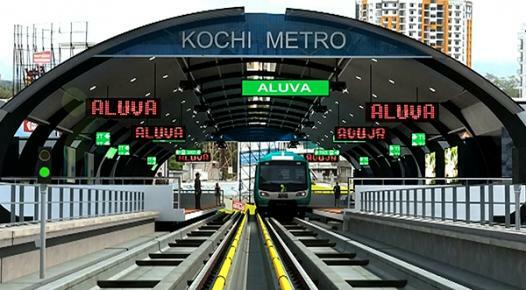 India's first solar-powered train Kochi Metro will commence trial in the Indian state of Kerala next month. Under the Kochi Metro project, solar power systems are installed on top of train coaches, all 22 stations and coach maintenance yards. The project shows Indian Railway's commitment to reduce its carbon footprint and dependence on power utilities. The solar power generated from the rooftop solar panels installed on top of the DEMU (Diesel Electric Multiple Unit) trains will contribute to 25 per cent of the electricity consumption. 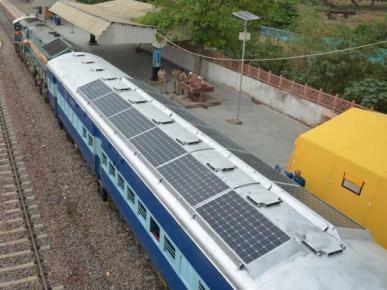 For the trial run, 12 solar panels are fitted on each of the six coaches on the Jodhpur division of the North Western Railways. Indian Railway signed a power purchase agreement for the rooftop solar power systems at Rs 5.51/kWh, which is a highly competitive rate for rooftop projects. Completing the installation of solar power systems at the 22 stations from Aluva to Pettah is just the first phase of the project. Indian Railway has set its eyes on setting up 500 Megawatts of solar power generation capacity that will meet the energy needs of more than 8,000 stations across the country. A senior rail ministry official told ETEnergyWorld that the objective is to minimise its energy consumption from outside sources. Ultimately, the railway company aims to consume zero energy from outside and be fully self-sufficient through its own solar power plants—a plan it calls "Net Zero Energy Plan". Experts estimate that the plan could cut down the railways' energy bill by 40 per cent. Renewable energy-focused consultancy firm BRIDGE TO INDIA's Managing Director Vinay Rustagi told ETEnergy World that the plan of generating its own energy as solar power costs are coming down significantly "is very sound". However, he is uncertain about the stability of the power supply that solar power can provide, as availability of solar power is for only seven to eight hours a day. Other subway systems in India have also moved to solar power systems. For instance, Delhi Metro has signed a Power Purchase Agreement with India's largest and cheapest solar power park, Rewa Solar Park. Kochi Airport is also the world's first airport to run entirely on solar power.